I set out yesterday for American Basin to see how the wildflowers were. I was not disappointed (see here). The photo of me posing by the Cinnamon Pass sign was taken by a handy tourist. Here I am posing next to the Cinnamon Pass sign. A tourist in a Jeep offered to take the picture for me. This is my first time this year for Cinnamon Pass. The alpine area between Ouray, Silverton, and Lake City is a veritable rabbit warren of Jeep roads. In other posts I discuss how to get to the Animas Forks ghost town. The GPS route below takes off from Animas Forks and ends in American Basin, where I photographed wildflowers. The track also shows the direction to Lake City. The road from Animas Forks to Lake City is part of the Alpine Loop, an all-day Jeep trip. A motorcycle can travel much faster over these roads. Note that the speed limit is not the speed of sound (some places 10 mph, some 15 mph), but traveling as slowly as a Jeep makes it hard to stay upright. So far every Jeep I’ve come up behind has paused to let me go by. I wave and say thank you. Argh! I've misspelled Cinnamon! A quick look at my trails reference book would have set me right. Anyway, here's the track, straddling two counties, San Juan and Hinsdale. The road itself is what I might call beginner++, or maybe intermediate-. There’s scree and it’s steep in places. I had no problem this time, but I’ve got a year under my belt since the last time I went up to Cinnamon. Sections of the road are very nice, which allowed me to slip into second gear for awhile. Here's the sign you see if you come from the Lake City side. Note the warning about 4WD. Your dirt bike should do just fine. You'll see this sign as you traverse the pass from east to west. Note the text below the CR5 sign. Traveling from the American Basin (Lake City) side across the pass, you cross the Hinsdale/San Juan county boundary. 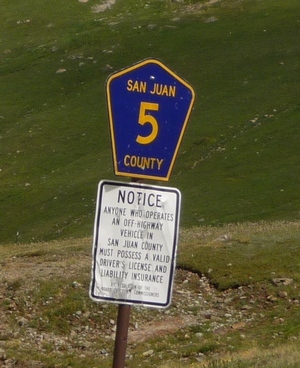 The road going west is San Juan County Road 5. But look carefully at the sign below it. Here’s what it says: “Notice[:] Anyone who operates an off-highway vehicle in San Juan County must possess a valid driver’s license and liability Insurance. By resolution of the Board of County Commissioners.” That means your underage kids can’t ride their own ATV. Also, any off-highway vehicles (including unlicensed dirt bikes) must have a sticker that says you’ve paid your tax. They enforce this. I went by a Forest Ranger who was checking motorcycles for tags. The Ranger asked me for mine, but I said my bike is street legal. He checked the license plate and said “Yep, street legal, and in Colorado, too!” I think he approves of locals! This entry was posted in GPS Tracks, Hinsdale County, San Juan County. Bookmark the permalink. The trail to Ice Lakes and Fuller Lake is a hiking trail, not meant for bikes. Lots of hikers, too so it would be dangerous if not illegal. The 4×4 road up to Clear Lake just to the east is a great dirt bike trail, though. Clear Lake is at 12,200′ or so and very pretty. Lots of brookies to 12″ if you like fresh trout (char). Watch the lightning. I had a close call on July 5, 1974 above Fuller Lake. Storms come up suddenly. Laura, I can’t find anything by that name on my map. Can you give me GPS coordinates (lat, long) and I can find it that way? Could you tell me if Ice Lake Basin (close to Silverton) is accessible on a dirt bike?